Let's start our journey with The Times a well known British daily paper born in London and the world’s oldest continuously published newspaper. When was "The Times" born? 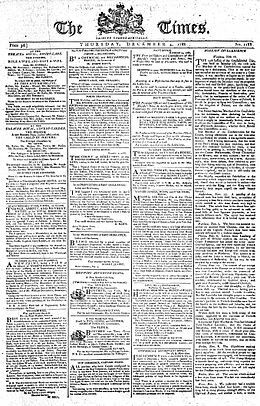 According to Wikipedia The Times was born in 1785 under the name of "The Daily Universal Register" and only three years later took the name "The Times". In 1821 the sister paper The Sunday Times was published. The two newspapers stayed independent till 1967 when they became owned by the same company. Highlights and curiosities about "The Times"
The Times was founded by John Walter who lost his job in 1784 after the insurance company where he was working went bankrupt. Being unemployed Walter decided to set up a new business opening a printing house to produce a daily advertising sheet and taking advantage of the latest typography techniques (logography) which had just being invented. The Times originated the the famous Times Roman font. Afterwards in November 2006 The Times began printing headlines in a new font, Times Modern. The Times invented war correspondents sending its journalists along with the army to cover specific conflicts (ex. Crimean War). Due to management struggles the newspaper was shut down for almost one year between December 1978 and November 1979. in 1981 The Times was then bought by Australian media magnate Rupert Murdoch. The Times has had an online presence since March 1999, originally at the-times.co.uk and later at timesonline.co.uk. 1) Chose the date first. 2) Choose your paper title and select your desidered edition (ex. National edition, Scottish edition, Irish edition). Please note that as titles in the archive are genuine, originals cannot be guaranteed for every date. 4) Select your pack. Depending on your needs you can go for the Newspaper Only option or choose among different gift options such as Classic Gift Box, Premium Gift Box, Wooden Gift Box, Luxury Presentation Folder, Picture Frame, etc. 5) Finally in case you want to make a gift add the recipient's name to the certificate of authenticity together with your chosen date and message.